Srila Prabhupada was so personal in his dealings with the devotees, and that was one aspect that was so attractive to people in the early days of the Krishna consciousness movement. You see how Srila Prabhupada, he always relished reciprocating love with his devotees. It simply wasn’t Srila Prabhupada asking for service or demanding things from his followers, but Srila Prabhupada always wanted to give back. And when Prabhupada would come to the temple in L.A., I always think that such a nice example of that was how Srila Prabhupada would reciprocate with us in this bhakti, this exchange of love, by giving flowers to the devotees as we would line up along the pavement. It was very sublime because Srila Prabhupada, he was never rushed. We would give him a flower, and then Srila Prabhupada would give us a flower. I always think how Srila Prabhupada said that love is an exchange of feeling, you need two for love. I remember sometimes when we would give a flower and then he would give one back, Prabhupada would just stand there so when we bowed down we could put our head right on Srila Prabhupada’s feet. He always had this very ecstatic, blissful smile, and you could see that Srila Prabhupada loved us in such a way that was practically incomprehensible because he saw us as these lost particles of spirit soul from Lord Krishna and he was so happy to play a part in bringing us back to Krishna’s lotus feet. So this was a real highlight in my life of being able to get a flower from Srila Prabhupada and give a flower back to Srila Prabhupada. So simple yet so sublime. 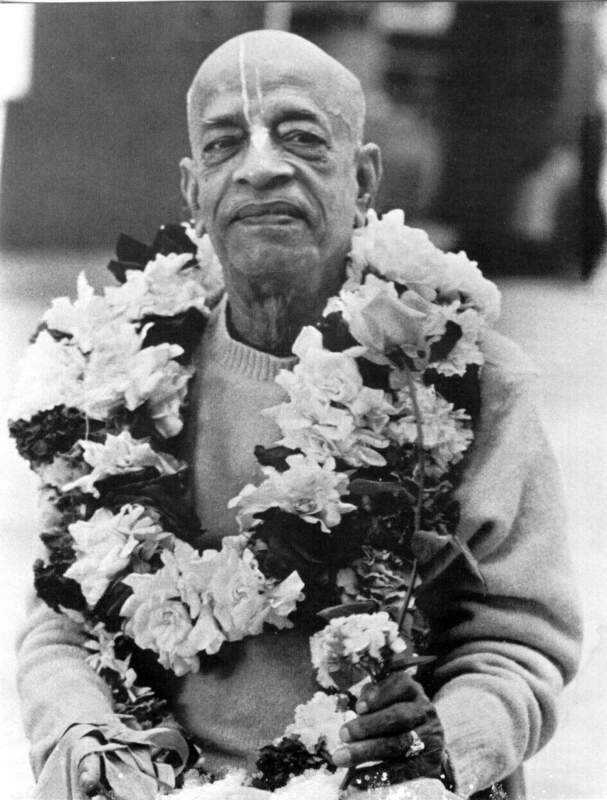 There was always one devotee who would block Srila Prabhupada’s walkway, his pathway into the temple just so he could get to ask Srila Prabhupada for his mercy or to say something to Srila Prabhupada, and Prabhupada never ever got disturbed or agitated that this person was being so bold in his approach. He would always just shake his head wonderfully or touch the devotee on his head with a blessing. So we all felt that this was a very special time where Srila Prabhupada was really giving us a blessing; and when he was handing us this flower, it was like Prabhupada was touching our heart with that flower, that soft lotus petal of his flower-like glance.